A handful of St. Louis residents are working to restore a piece of north St. Louis history damaged in a massive fire almost a year ago. The fire destroyed much of the Clemens House located on Cass Ave. last July. The home was originally owned by James Clemens Jr., Mark Twain's Uncle. "The love story to me is the fascinating thing," said Jim Meiners. Meiners is referring to Clemens request to use an imprint of his late wife's face as a part of the decor on the 25 windows along the house. Meiners considers archeology a hobby and asked to preserve whatever items he could before the home was demolished. He ended up with thousands of tons worth of cast iron, original bricks, a foundation stone as well as more than a handful of the windows with the clay mold of the late Eliza Mullanphy's face. He and a handful of other volunteers are working to preserve as much as they can to eventually put it on display. Meiners hopes to have a display at the City Museum. "It's going to be a room with corners," he said " Just like it was in the house with windows and doorways." The group set up a GoFundMe campaign to raise $30,000. Meiners hopes to have the display ready by this summer, hoping to have a place to showcase it. "The story needs to be told," he said, "so that's what I'm all about." A St. Louis City landmark was among the three buildings firefighters battled blazes at in north St. Louis early Wednesday morning. Just before 4 a.m., the James L. Clemens House, a four-story building at 1849 Cass, near Mullanphy and Helen Street, caught fire. The St. Louis Fire Department said wind conditions were creating challenges and there were a number of spot fires from floating embers. The fire reportedly destroyed the buildings roof and a wall. Initially we sized it up as a warehouse but its been brought to our attention that it may indeed be a historical building, said St. Louis Fire Capt. Garon Mosby. It was fully involved with fire. Fire from front to back. The Clemens House was built by Mark Twain's uncle, James Clemens, Jr., in 1860. After his death, Clemens heirs sold the building to the Sisters of St. Joseph. In 1971 the house was made a St. Louis City landmark. Capt. Mosby said after firefighters were in a position to battle the Clemens House fire, they received a call for another fire about half a mile away at North 15th and Cass. When Fire officials arrived at the two-story building at North 15th and Cass they reported the structure was fully involved and they were taking a defensive stance. Then, just before 5 a.m., firefighters were called to put out a fire at a vacant two-story building in the 1600 block of Helen, which is located down the road from the original fire. After the third fire, officials with the fire department said they requested a fourth alarm to help because there were multiple structural fires in the area. The department also said firefighters were in the area wetting down rooftops to prevent additional fires from the floating embers. The cause of the fires is currently under investigation. There are no known injuries. 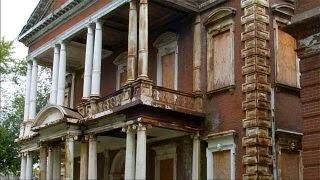 Gutted by a July fire, its a matter of time before the rest of the stately mansion built in 1860 is demolished. 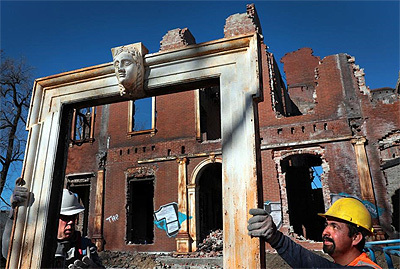 But some portion of the Clemens House  complete with cast-iron busts, Greek-revival columns and classic red St. Louis brick  will hopefully live on somewhere other than its Cass Avenue address north of downtown. Jim Meiners wants that place to be City Museum. He and his crew have been at work for the last three weeks salvaging what they can from the mansion built by wealthy St. Louisan James Clemens Jr., a relative of Mark Twain. They hope to reconstruct a small part of the mansion in City Museum so people can get an idea of just how grand this house was, Meiners said. With eight iron windows topped with Greek-revival busts, some salvaged columns and enough brick from the fire-gutted structure, he said he should have enough to recreate a portion of the house in the downtown museum. He already has a relationship with City Museum, where he has donated other artifacts hes collected from around St. Louis. For years, the historic mansion on Cass Avenue stood empty. It was acquired by a company affiliated with developer Paul McKee in 2005 and later transferred to his NorthSide Regeneration company. Plans to rehab the structure never materialized before fire destroyed the Greek revival mansion last summer. Meiners said McKee is donating the artifacts to him and that the developer has been very accommodating. McKee had been issued a demolition permit last month but said he wanted to save the more fragile pieces of architecture before tearing the rest down. Some distant relatives of the Clemens family have contacted McKee about obtaining some of the busts. 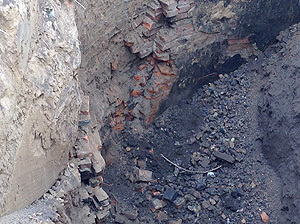 He said he will be preserving those and as many bricks and other artifacts as possible for whatever we rebuild on this site. This didnt happen by accident, McKee said. The idea was trying to hang on to as many of these artifacts as we could. As for Meiners, he is salvaging the mansion at his own cost. He hopes to recoup some of the expense with a GoFundMe campaign. Discolored by oxidation, the copper box had been sealed within a time capsule since 1896 in the foundation of the chapel at the Sisters of St. Joseph of Carondelet's former Our Lady of Good Counsel Convent at 1849 Cass Avenue, popularly known as the Clemens House of Samuel Clemens fame  aka Hannibal's Mark Twain. Now, it was about a half-mile to the west at 1421 Jefferson Avenue in the St. Louis Fire Department Headquarters' media center, sitting on a table covered with white paper and awaiting its grand reveal. The crowd gathered March 28 included Sisters of St. Joseph, developer Paul McKee, Clemens' family descendant Elizabeth Boland-Barbieri, St. Louis media and interested firefighters, including chief Dennis Jenkerson. They watched intently as landscaper and salvager Jim Meiners, with assistance from McKee, pried open the stubborn box, which had been tightly sealed with lead. Meiners removed the contents one item at a time, items that had been untouched by human hands since the 19th century, items the Sisters chose to preserve for future generations and tell the story of their time 122 years ago. 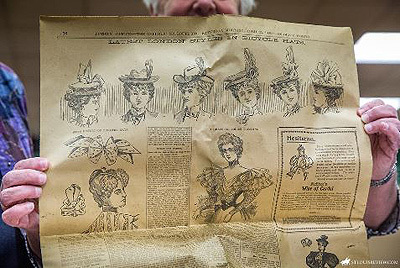 To that end, they saved five newspapers, which emerged yellowed and brittle but intact  the St. Louis Post-Dispatch, Globe Democrat and Republic, and two issues of Church Progress, with one including a front-page story about late St. Louis Archbishop Peter Kenrick, who had died a month earlier. It cost $1.50, for a year's subscription. The Globe cost 2 cents per issue, double the Post-Dispatch, which touted beneath the name plate, "All Bicyclists Look To The Post-Dispatch For Bicycle News." The sisters also saved two pamphlets  the constitution and bylaws of the Ephpheta Society, a shoutout to their initial ministry in St. Louis of teaching deaf children. "Ephpheta Society is a society for the deaf. 'Ephpheta' is from the gospel  healing of the deaf," said CSJ archivist Sister Jane Behlmann, noting that the Sister's St. Bridget Deaf Mute Institute was briefly in the convent after the sisters bought it in 1885. Meiners also pulled out six religious medals, a "Jerusalem" cross, a one-inch statue of St. Joseph, a medallion commemorating Archbishop Kenrick's priestly jubilee in 1891, a scapular of Our Lady of Good Counsel and a handwritten, single-sheet letter addressed to the bishop of St. Louis and detailing what was then the Sisters' 60-year history in St. Louis. The yellowed paper had disintegrated in multiple places, but Sister Jane was able to read aloud the first paragraph, which detailed their arrival from Lyon, France, in 1836 at the invitation of Bishop Joseph Rosati and their first ministry teaching deaf children. Later, Sister Jane described the experience of reading something locked away for 122 years as, simply, wonderful." She added another "wonderful" for good measure. McKee likewise alternated between "very cool" and "really cool" in describing the experience. 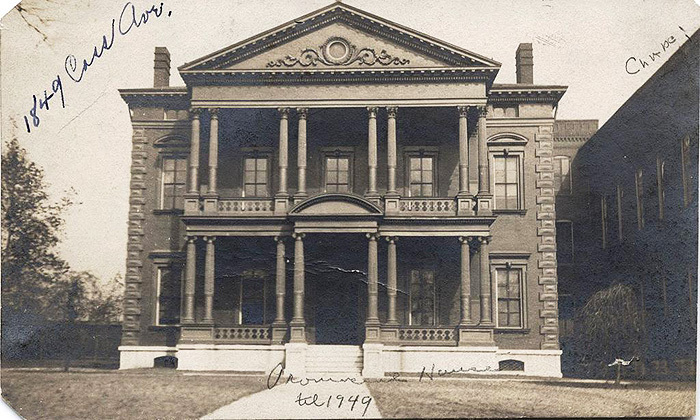 Twain's cousin, James Clemens Jr., built the mansion in 1860 on property inherited from his father-in law, John Mullanphy, in honor of his late wife, Eliza, who died of cholera in 1953. Mother Agatha Guthrie bought it from his heirs in 1885 for the Sisters of St. Joseph. The CSJs used it as their base for 64 years to staff parish schools in north St. Louis City and north St. Louis County. The Our Lady of Good Counsel Convent served as home for teaching sisters until new parishes built on-site convents. Occupancy fluctuated based on the completion of parish convents, but 80 to 100 sisters lived there over the years, representing 17 parishes. The Sisters added a four-story dormitory at the rear of the mansion/convent, then the large chapel next to the building in 1896. The Sisters of St. Joseph sold the property in 1949 to the Vincentians, who needed to relocate and make room for construction of Interstate 55. Thirty years later, they gave it to the Catholic Worker community, which used it as a homeless shelter. Developer McKee ultimately bought the then-vacant property in 2005 and had hoped to redevelop it as part of his Northside Regeneration. A four-alarm fire in July, believed to be arson, ended that idea, but out of those ashes arose gifts from sisters of 1896. The property sits on the northern outskirts of Downtown St. Louis at 1849 Cass Avenue. 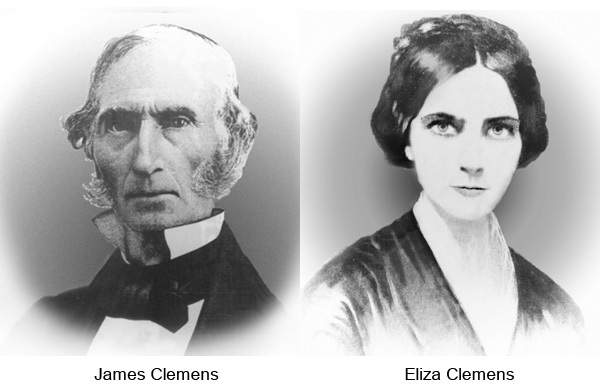 In 1858, James Clemens Jr. constructed the iron-clad home adorned with the memory of his late wife, Eliza Mullanphy Clemens. Eliza passed away from cholera in 1852, 6 years before the completion of the home. Clemens commissioned architect, Patrick Walsh, to construct the Greek Revival style mansion with cast iron features to ensure that the structure would be fire-proof. It is believed that iron ornaments adorning the 25 exterior windows were created from a cast of Elizas death mask. Plaster artist, Porter White, reproduced Elizas image throughout the house. Elizas face could be found in plaster window lintels, ornamental ceiling moldings, and above the mantels. Please donate what you can. Funds will be used to reimburse for costs of special equipment and crew needed during the deconstruction process, and for planning and executing the final exhibit. We have salvaged major elements of the Clemens Mansion, including intact window surrounds, entry arch, columns, and cast iron quoins. Eight entirely perfect windows with Eliza's face are available for a museum display, and we would like to rebuild a portion of the facade as part of the public installation. For the rebuild, we will use brick from the outside of the mansion as well as stone, porch railings and interior trim. We are thrilled at the opportunity to preserve a portion of the the scale and beauty of this structure, and display it in a collection where the public can touch, interact, and study the craftsmanship of this historic St. Louis building. In addition, we plan on going in the back yard and finding and digging the privy which has long-buried artifacts which date back to the building of the house. At this time, we are in discussions with several St. Louis-based organizations to collaborate on a final local site to house the collection. Discussions are ongoing with the City Museum downtown, a possible site in Old North St. Louis, and others. Im Jim Meiners, curator of urban archeology display at the City Museum in downtown St. Louis. We are raising funds to enable salvaged architectural artifacts from the Clemens Mansion to be displayed as part of a public installation in St. Louis. Web presence designed by WebXtras, LLC ©2008-2016. All rights reserved.